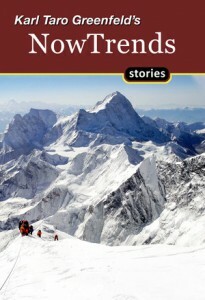 Karl Taro Greenfeld’s NowTrends (Short Flight/Long Drive Books) is worth reading simply for the exotic locations and unique settings, but there is much more going on in this collection. A layered sadness permeates these stories, often soliciting sympathy for the main characters. At other times, a sense of entitlement causes the reader to become frustrated and even angry at these spoiled people. And still other stories allow us to understand the uncertainty that life offers up, even amidst important events and epic moments, unsure of how to take these revelations, unable to change—even when willing. Another moment where you wonder to yourself what the hell is going on. Where is this story going to take me, why the urine, why the naked man? Suffice it to say, the stories expand and develop, the hooks revealing only the tip of the iceberg, the entire narrative slowly unfurling. Greenfeld is widely recognized for his creative non-fiction and journalistic pursuits, in addition to his storytelling abilities. The authority and sense of place he creates must certainly be informed by his globetrotting and wanderlust, but whether he’s actually been to these places or not isn’t important. The feeling of immersion, the details, the local flavor—those aspects of his stories add a layered depth to the settings and lifestyle of the natives and tourists alike. “I was sure you were going to die in that hospital room. And then, I thought to myself, you would finally be free. He wants his sister to stop suffering, so he shares his life with her, albeit begrudgingly. And even though he feels it as a chore, it weighs on him that he can’t do a better job of helping her to live vicariously through his life. “I had taken my seat on a bench when I saw a brick that had loosened from the path around the playground. I gathered the brick and put it in my shopping basket. My baby would wail horribly when I smashed her calf with the brick. She would never do a roundoff in her life. Why had I done this? she would ask if she already had words, looking up at me with uncomprehending eyes thick with tears. Why? Reminiscent of Toni Morrison’s Beloved, or to a lesser degree, George Saunders’s “Puppy” the echo of that brick, the wailing of the child, the black spot it must have cast on the heart of the mother, Xiao, it will stay with me for a long time. If you are not yet familiar with Karl Taro Greenfeld’s non-fiction work, be sure to keep an eye out for Speed Tribes and Boy Alone. His short fiction, including some of the stories in here, was first brought to my attention in the Missouri Review, as well as The Paris Review, two of the finest journals out there for contemporary fiction. I mention these publications, as well as his recognition in the Best American Short Stories anthology and the O. Henry Prize Stories anthology, to show you that I am not alone in finding his work compelling, entertaining, and everlasting. This collection of stories, NowTrends, will leave a mark—both on your mind’s eye and your own aging heart.